President Francois Hollande pleaded with Germany and other European partners on Thursday (18 September) to be patient with France and give it more time to reform before it meets deficit targets, admitting that results were coming too slowly. Hollande told a news conference that Paris would join the United States in air strikes in Iraq to combat Islamic State fighters, who have seized swathes of the country, but said he would not attack the militants in their Syrian stronghold. He also brushed aside an unflattering portrayal of him in a best-selling book by ex-partner Valerie Trierweiler published earlier this month, saying it was “tough” to be president. But his upbeat mood and “man of action” posture on foreign affairs contrasted with the absence of new policy initiatives on economic reform or fiscal policy. The Socialist leader, whose approval ratings have slumped to an all-time low of 13%, promised he would work till the end of his term in 2017 to modernise France, revive its stagnant economy and protect its generous social model. Rejecting pressure to scrap the 35-hour work week, cut the minimum wage, raise the retirement age or leave the euro zone, Hollande said France should not be expected to carry out in five years labour market reforms that had taken Germany 10 years in far more favourable economic conditions. Two weeks after Paris irked EU partners by saying it would not bring its public deficit down to the EU limit of 3% of national income until 2017 – two years after a repeatedly extended deadline – Hollande said he would not go beyond the budget savings already announced. “France will not do more than that because it would be bad for growth. France will not raise new taxes, which could hurt the recovery,” he said, adding that Prime Minister Manuel Valls would explain that position to German Chancellor Angela Merkel when they meet in Berlin next Monday. Speaking before 350 reporters in the grand ballroom of the Elysee presidential palace, Hollande conceded results were slow to come but added France had won backing from European Central Bank chief Mario Draghi and new European Commission President Jean-Claude Juncker for measures to stimulate growth in Europe. Hollande said he was willing to go further in European Union integration with Germany, notably in the transition to sustainable energy, and to move towards a “multi-speed” Europe. Speaking as Scots voted in a landmark referendum on independence from Britain, the French leader voiced concern at the danger of the EU and individual member states unravelling. “After half a century of building Europe, we risk entering a period of deconstruction,” he said, noting that the Scottish vote could set a precedent for the disintegration of other European countries and of the bloc itself. He rejected alternative policies offered variously by France’s employers’ organisation, dissidents in his Socialist Party and further left, and the far-right National Front. Tearing up working time, pay and pension rules would merely create greater inequality and increase unemployment, already close to 11%, he said. Leaving the euro zone and re-erecting national borders against imports and immigrants would isolate and impoverish France, while letting deficits soar to try to spend the country’s way out of economic crisis would destroy market confidence. 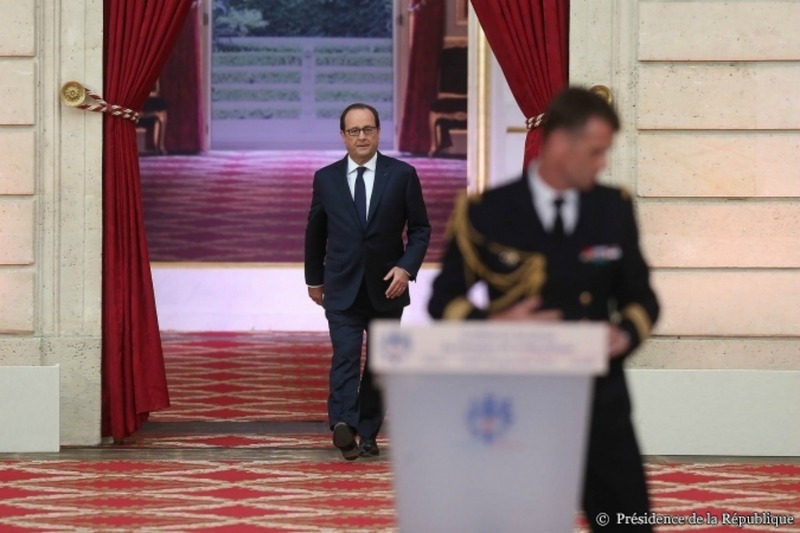 Asked about a report that credit ratings agency Moody’s had informed the government that it was about to cut France’s rating again to Aa2 from Aa1 because of the delay in bringing down the deficit, Hollande said he had no such information. Rejecting suggestions that slowing down the pace of deficit reduction could destroy market confidence, he said France’s borrowing costs were at a historic low, which showed that markets had faith in its ability to repay its debt. Turning to foreign policy, he announced that France would send a military field hospital to Guinea to help fight the Ebola epidemic gripping West Africa. He ruled out French military action against Islamic State militants in Syria, fearing that this might aid Syrian President Bashar al-Assad, whom France has staunchly opposed. Washington welcomed his announcement. “This is a significant contribution to the efforts of the growing international coalition to combat ISIL,” said White House spokesman Josh Earnest, referring to Islamic State. Referring to allegations by British and American officials in recent weeks that their nationals had been killed by Islamic State militants in part because other countries were paying ransoms, he denied that such payments were French policy. “France does not pay ransoms. France doesn’t engage in prisoner exchanges, but that doesn’t mean other countries don’t. Some countries have done it to help us, I admit that,” he said. With an annual deficit of 4.1% of GDP in 2013, France has exceeded budgetary limits established by the Treaty of Maastricht. The European Commission launched measures to deal with excessive deficit and gave France an extra two years, until 2015, to reduce its public deficit to 3%. But France announced in September 2014 that it will not reduce its budget deficit to within EU limits until 2017, despite the extra time given. France's announcement went down badly with some eurozone finance ministers who saw it as an affront after the painful cuts many governments have implemented to bring down swollen deficits and win back investor confidence. Hollande won’t do anything that might make him more unpopular, seeing that his popularity is now holding firm at a solid 13 %. If it were to drop to 10 it supposedly might affect his decision to stay the full term. What will it take to get rid of this man? What does he do all day, except for worrying about his pension? Maybe he could sell those undelivered Mistral’s to Iran or N. Korea. The Euro is getting crushed today so maybe things won’t look so bad tomorrow. Yep, the euro continues down the slope having lost 5 percent value over the past thirty days. At this rate France will be back in the black by this time next year.